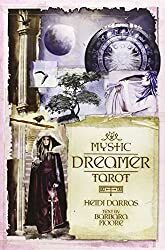 The Mystic Dreamer Tarot was one of those decks I saw lots of buzz about when I was in the market for a new deck, so I took a closer look. It was lovely! The images are digitally manipulated photos, somewhat more modern than Rider/Waite, but styled to retain a fantasy/medieval feeling. Even for the most modern images, the burnt paper design of borders and embellished typeface keep the overall Renaissance mood of the deck intact. It’s indeed an engaging and pretty deck. While some imagery reflects Rider/Waite standards, some deviate. All imagery included, however, reflects traditional card interpretations, although sometimes with different symbolism. Still, it’s close enough it won’t confuse you. This is a deck you can sit down and read with immediately. The cards in this deck all include the moon, intended as a sign of the intuitive process in reading, going deeper and not being fooled by initial illusion. Many/most also feature a Raven, suggested to represent the subconscious and the hidden mystery of Tarot. Unfortunately, that convention makes the additions less meaningful overall, since it’s not specific to certain cards. So while I appreciate the intent, I didn’t feel like the constant prodding to “look deeper” was really required. You wouldn’t have picked up a Tarot deck if you’re not looking deeper already. The full-length companion book included, “The Dreamers Journal,” is superior to your standard Little White Book. Written by Tarot expert (and all-around cool chick) Barbara Moore, it provides an overview of each card, background and story, and finished up with a few questions intended to stimulate intuitive reading. This makes the book a good companion for someone new to reading, giving enough guidance to get them started with approachable explanations, but without an overly authoritarian tone that might discourage wandering beyond the given interpretation. All in all, I like this deck. It’s similar enough to traditional decks to be easy to read, but different enough to stimulate creative interpretation and fresh insights. The images are engaging and rich, with both old and new symbolism that’s bound to tweak your imagination. I think it would make a nice starter deck for the new reader who found the Rider-Waite less than enchanting, or a new friend for the experience reader who is looking for a fresh voice. Like this deck? Anybody have it? I keep this deck in my purse. While I have other decks I love, this is my goto deck. I’ve read for myself, friends, cops and even Greek mafia with them. They’re sturdy, honest and beautiful. The images are exactly like my actual dreams. It’s like somebody took screenshots while I was asleep. I’m about to learn Lenormand, but this will always be my dearest Tarot deck.